Snap Track offers numerous fittings to make the system easy to install. The Snap Track system was designed and is intended to be used as a UL Classified continuous assembly of straight sections, fittings, and accessories used to form a structural support, for the purpose of supporting, protecting, and securely fastening cables. When installed in a continuous manner the entire Snap Track system is UL classified as an equipment ground conductor (EGC). TechLine Mfg. 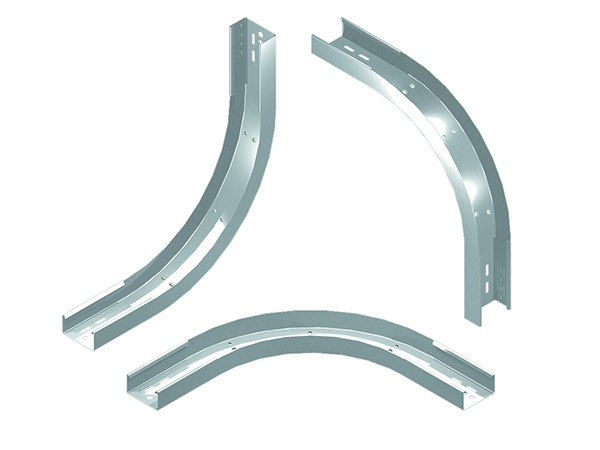 manufactures long radius elbow fittings to enhance ease of use for Snap Track cable tray systems. (4) Patented Push Pins are provided for a secure attachment. 3/8” cable tie down holes provided for 12” radius fittings and larger. STVO-2-2-AL-12R 2" 2" 23" 12" 3 lbs. STVO-4-2-AL-12R 4" 2" 23" 12" 4 lbs. STVO-6-2-AL-12R 6" 2" 23" 12" 5lbs. STVI-2-2-AL-14R 2" 2" 22.5" 14" 3 lbs. STVI-4-2-AL-14R 4" 2" 22.5" 14" 4 lbs. STVI-6-2-AL-14R 6" 2" 22.5" 14" 5lbs. STHE-2-2-AL-12R 2" 2" 23" 12" 3 lbs. STHE-4-2-AL-12R 4" 2" 25" 12" 4 lbs. STHE-6-2-AL-12R 6" 2" 27" 12" 5lbs. STVO-2-2-AL-24R 2" 2" 35" 24" 5 lbs. STVO-4-2-AL-24R 4" 2" 35" 24" 6 lbs. STVO-6-2-AL-24R 6" 2" 35" 24" 7 lbs. STVI-2-2-AL-24R 2" 2" 35" 24" 5 lbs. STVI-4-2-AL-24R 4" 2" 35" 24" 6 lbs. STVI-6-2-AL-24R 6" 2" 35" 24" 7 lbs. STHE-2-2-AL-24R 2" 2" 35" 24" 5 lbs. STHE-4-2-AL-24R 4" 2" 37" 24" 6 lbs. STHE-6-2-AL-24R 6" 2" 39" 24" 7 lbs. STVO-2-2-AL-36R 2" 2" 47" 36" 7 lbs. STVO-4-2-AL-36R 4" 2" 47" 36" 9 lbs. STVO-6-2-AL-36R 6" 2" 47" 36" 10 lbs. STVI-2-2-AL-36R 2" 2" 47" 36" 7 lbs. STVI-4-2-AL-36R 4" 2" 47" 36" 9 lbs. STVI-6-2-AL-36R 6" 2" 47" 36" 10 lbs. STHE-2-2-AL-36R 2" 2" 47" 36" 7 lbs. STHE-4-2-AL-36R 4" 2" 49" 36" 9 lbs. STHE-6-2-AL-36R 6" 2" 51" 36" 10 lbs.